Dr. Levine developed 360°smarthealth™ antixoidantvitamin® more than 25 years ago and has continually been updating the formula to fit with the latest scientific information. When Dr. Levine started his Internal Medicine and Anti-Aging practice, patients were interested in what vitamins they should take. Rather than simply recommend a best selling vitamin, Dr. Levine was curious to research which plant compounds could actually optimize your health. Dr. Levine thoroughly researched the scientific literature to find what plant compounds were the most beneficial. He also gained valuable insight from nutritional supplement insiders and consultants that provided inside information into the nutritional industry. It quickly became obvious that most antioxidants being sold contained inadequate dosages and did not provide a comprehensive spectrum of antioxidants. Rather than provide his patients a list of numerous, separate bottles of antioxidants to be purchased, Dr. Levine designed the most comprehensive antioxidant formulation available in one bottle. The key to protecting and providing benefits to the entire body lies in diversity of antioxidants as each antioxidant has special site in the body where it is most effective. For example, CoQ10 is in every cell of your body, but has enormous benefits for your heart. Resveratrol, B Vitamins, Grape seed extract, Garlic and Green Tea is most beneficial for the heart. Lycopene, the plant compound that makes watermelon, tomatoes, and red peppers, red, is most beneficial for the prostate. Silymarin and N-acetyl-L-cysteine are most beneficial for your liver. Bilberry, Lutein, Zeaxanthin, Beta-carotene, and Vitamin A are most beneficial for your eyes. B12, Gingko Biloba are most beneficial for your brain. 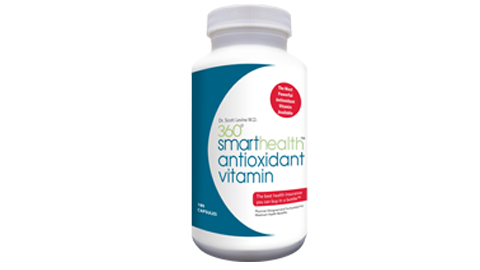 360°smarthealth™ antioxidantvitamin® is a virtual cornucopia of antioxidants obtained from fruits, plants, roots, and vegetables. Another important difference between 360°smarthealth™ antioxidantvitamin® and other antioxidant formulations is that Dr. Levine designed his vitamin to mimic nature. Most store-bought vitamins contain only a portion of the beneficial plant compounds that exist in nature. For example, the majority of Vitamin E products being sold only offer d-Alpha- Tocopheryl. But that is not how Vitamin E exists in nature. Vitamin E exists as a collection of Tocopheryls. When you eat a nut, you obtain not only the benefits of Vitamin E, d-Alpha- Tocopheryl, but you also get all the sister compounds that are beneficial to your body, including d-Beta-Tocopheryl, d-Gamma- Tocopheryl, and d-Delta- Tocopheryl. These sister compounds are essential to providing optimal results, and the key reason why eating foods containing antioxidants always are more beneficial than taking vitamin supplements. In some cases, the sister compounds may be more valuable to your body than the main antioxidant in the food itself. 360°smarthealth™ antioxidantvitamin® was specifically designed by Dr. Levine to scientifically mimic how antioxidants exist in nature, so maximal benefits could be obtained. Another important difference is that Dr. Levine uses what are arguably the most efficacious and highest-grade raw materials. Dr. Levine proudly displays on the label the percent of active ingredients. Any vitamin bottle that does not list this, does this for a reason, they are using cheap raw material whose benefit is suspect. 360°smarthealth™ antioxidantvitamin® proudly lists the quality ingredients on the label, for example, the Grape Seed is 95% OPC, the Curcuma is 95% curcumin, the Lutein is 10% marigold esters, Silymarin is 80% milk thistle esters, etc. These ingredients represent the best raw materials available. Manufacturers, who designed a vitamin by price, will not typically use these most efficacious raw materials, as they are too costly, instead they will simply list an ingredient without listing the percent of active material in it, as in most cases the cheap raw material was never even tested for the active ingredient! Other important factors to consider in creating and efficacious vitamin include the proper cultivation, harvesting, extraction, and dosage of the beneficial antioxidants. At any step along the way, the effectiveness of the antioxidant raw material could be damaged. Many Chinese raw materials have been contaminated with lead, toxins, bacteria, fungi, or carcinogens. The actual extraction process method could damage the efficacy of the antioxidant or contaminate it with toxins. Many manufacturers buy cheap raw materials that have not been carefully processed, and use inadequate dosages, simply to list the ingredient on the bottle. The focus of most manufacturers is to design a vitamin based on a given purchase price and then work backwards to create it. Dr. Levine has the opposite approach; design the best, most comprehensive vitamin for the few who want optimal benefits and protection. Dr. Levine has always sought to provide the best, safest, most efficacious nutrients for those that are focused on optimal health. If you are looking to provide the safest, most efficacious, antioxidant formula to protect and optimize your health, then click below.